Edcamp SC is coming to Rock Hill, SC on Saturday, September 7th 2013! We look forward to a day of learning. Edcamp SC will take place at Sullivan Middle School. The physical address is 1825 Eden Terrace Rock Hill, SC 29730. We are currently working with local businesses to secure discounted hotel room rates! 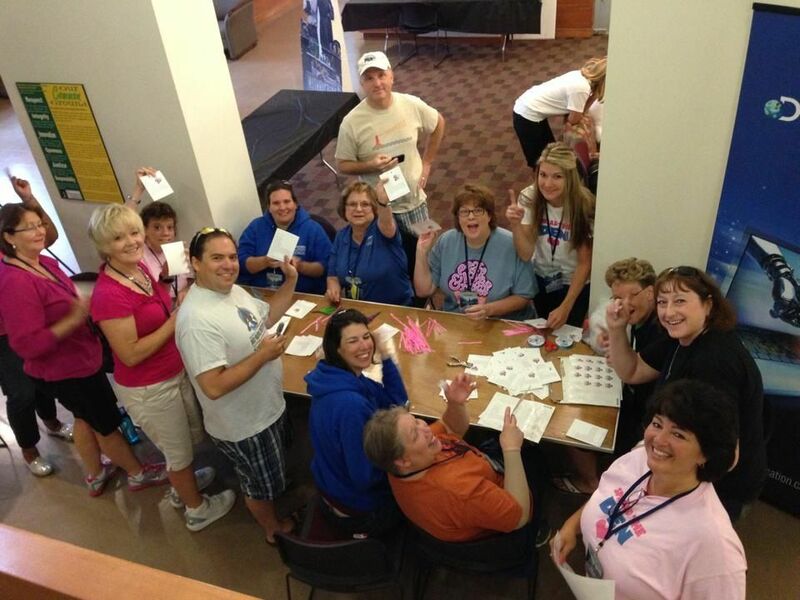 What makes edcamps exciting and new? They are driven by educators, for educators! If you have not been to an edcamp before, you will love this experience. We are not trying to make a profit, just trying to facilitate learning among ourselves. All sessions are 100% participant driven and the schedule of sessions is made that very morning! Topics are not predefined and set in stone months before the event. consider presenting. You decide the topic and share your knowledge. It does not have to be fancy and polished. Just share what you know! Make plans to stick around Rock Hill after EdCamp SC for a joint Carolina’s DEN event. More details coming soon! Come learn and network with other teachers and administrators from North and South Carolina. We will be having sessions on Common Core, Essential Standards, Pedagogy and Technology. We will be holding a raffle prize give away with some great prizes! Tell a friend and join us! The conference will be held in the College of Education Building @ University of North Carolina- Charlotte (UNCC). 5. Back to DENSI: My first DENSI was in Boston in 2010. I was relatively new to the DEN, and the whole experience of that institute changed my view of my role in it. In 2011, I gave birth to our youngest son during the week of DENSI. This year in Vermont was my first opportunity to come back. From the moment that I walked through the doors of the dorm, my absence seemed so insignificant. It was like I’d never been physically gone, and the relationships that I had forged virtually over the past three years, were alive and well in this face to face environment. On Wednesday night, we had an excursion to the Vermont Lake Monsters baseball game, and I happened to remember to check in on FourSquare. This screen is what I saw. While it doesn’t seem that exciting, the first reminder struck me. The “Chad” it refers to is DEN Community Manager, Chad Lehman, and our last face to face, was playing cards in Boston Logan Airport as we were leaving for home after DENSI 2010. I was all of a sudden struck by the length of time that really had passed since I had been face to face with these people that are true friends, but I was overwhelmed by how much I value the time we do get to be together! 4. DEN Serves! Zulma Whiteford, DEN Star Extraordinaire, organized a service project for the LC Pre-Conference participants where we packed lunches for a local food service organization and prepared thank you cards for foster families in the Burlington area. We spent less than an hour working together, and we wanted to do more. This project led to the idea of creating a DEN Serves month where DEN Stars, members, and schools take the opportunity to give back to the communities in which they live. The DEN is about people, and what better way is there for us to show our community spirit than to give back! 3. Presenting as a DEN Guru. This was my first conference as a Guru. While I am still amazed and humbled by this honor, it was a unique experience to attend DENSI in this role. I present workshops in dozens of places to hundreds of people each year. I have never been more terrified than I was to present at DENSI. When I present at local and regional workshops, I know that my audience often ranges from no experience to avid users of technology. I am usually pretty confident that I will have something new to share and some solid tips for technology implementation in the classroom. When I was planning for DENSI, I knew that my audience included the best and the brightest of educators from across North America. I didn’t know where to begin because I wanted to ensure that my content was something new! Secretly, I was terrified and relieved that I was in the first session of training. Getting positive feedback from my DEN friends was so meaningful to me, but I can’t explain how much it meant to go through the process of preparing for and presenting to such an esteemed audience! Here are some links to my resources! 2. People, Not Ideas. When I think about the DEN, I immediately think about people who are passionate about teaching and learning, kids, and networking for the good of the group. Each event I attend with the DEN grows my belief that teachers will never become obsolete, they will just evolve. Each memory that I recall from DENSI is triggered by people, like our #densiroadtrip with Kate, Alison, and Judy or the DEN-Mazing Race with my awesome team of Alison, Pete, and Jake. I’ll think of late night boys versus girls TV theme song trivia with Dean and the search for Champ with Brandon. When I think of Aurasma, I’ll think of sitting with Rafranz to brainstorm ideas and working with Kate to build one for her costume. When it comes to great laughs and new friendships, DENSI will be the summer that I got to know Dave T, David F, and Dennis. My life is richer thanks to these people, and more! The content will come with the people, and I will continue to learn because I know the people of the DEN are there to support me – personally and professionally. 1. JOY! I always have affective goals for my classroom. I want my students to love learning, but when Dean Shareski shared his Joy! video, I was incredibly moved. It is my personal goal to make sure that my classroom, and hopefully my school, will be a place of joy this year! I know that this video will be a go-to on my tough days, for sure! I’d be honored to have my students feel the same way about the learning in our classroom. I am always looking for the easiest way to find usable photos for my blogs, students projects, and more. Recently, Paul Cancellieri (@mrscienceteach) was giving a blogging workshop I attended, and he shared Photopin. My life is changed! This is, by far, the easiest to use photo search site that I have used. It’s an easy interface, and once you choose the picture that you like, it is super simple to grab the image and its citation. Check out the image below! You pick your size to download and then just copy/paste the credit information. 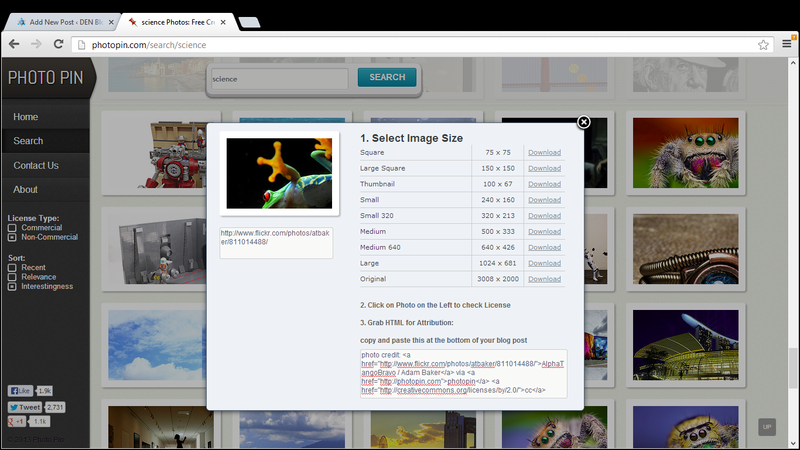 If you are looking for a new image source, check out this easy option!